Afghanistan's parliamentary and district council elections are scheduled for October 20 of this year, but attacks by militant Islamists have already raised concerns whether the elections will be held on time. Taliban and "Islamic State" (IS) continue to target voter registration centers in different parts of the strife-torn country. 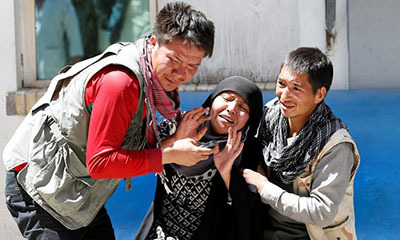 An IS-claimed attack at a voters' office in Kabul last month killed 57 people, including women and children, underlining the fact that the participation in the election process comes with a huge risk for the Afghan people. But a lack of security is not the only reason behind people's reluctance to participate enthusiastically in the election process; the voting procedure, marred with fraud and irregularities, has left many people pessimistic about the entire system. Political commentators say that many Afghans have little faith in the election process. "Afghanistan's Independent Election Commission (IEC) has the responsibility to restore trust among the Afghan people in the electoral procedure, but it has so far failed to do so," Fazal Ahmad Manawi, former head of the IEC, told DW. The IEC launched a campaign in April to register at least 14 million voters before the October polls, but so far only 4 million have registered. Manawi said that even the 4-million figure was exaggerated and that he doubted its accuracy. "We know that fewer people actually registered," Manawi said. The current state of the Afghan parliament is also a reason why many Afghans are not interested in the election process, say experts. Human rights activists accuse Afghan lawmakers of nepotism, corruption and even crimes like smuggling. People fear the next parliament will be no different. "Candidates who use illegal money to contest and win elections won't care much about the voters. They will only be interested in getting their money back once they get elected," Naim Ayobzada, head of the Transparent Election Foundation of Afghanistan NGO, told DW. Despite electoral frauds and Afghans' lack of interest in the October polls, many believe that elections are the only way forward for a country struggling to get on its feet. The continuation of democratic process could be the only option for Afghans to make their voices heard and defeat unlawful forces, including militants, analysts say. A good omen is that a number of educated young candidates are also running for parliament and district councils. This gives hope that Afghanistan could see better governance in the years to come should the democratic process continues. Obiadullah Azizi, a candidate for a district council in Balkh province, hopes the participation of youth in the election could turn things around for his country. "People must vote for young, educated and committed candidates who I believe will represent them best," he told DW. Tariq Iqtedari of the Generation Positive organization has launched a social media campaign to urge voters to cast their ballot wisely. "We should not make any mistake. Those who buy votes will definitely compromise on our national interests," the organization said in a Facebook video message.